“Benefits for Humanity: From Space to Surgery,” a NASA documentary published February 22, 2018, explores the space robotics origins of Synaptive Medical’s robotic digital microscopes, Modus V™ and BrightMatter™ Drive. The video examines how technology originally used to create Canadarm2 on the International Space Station has been adapted to healthcare and is now benefiting patients with brain cancer and spine diseases. 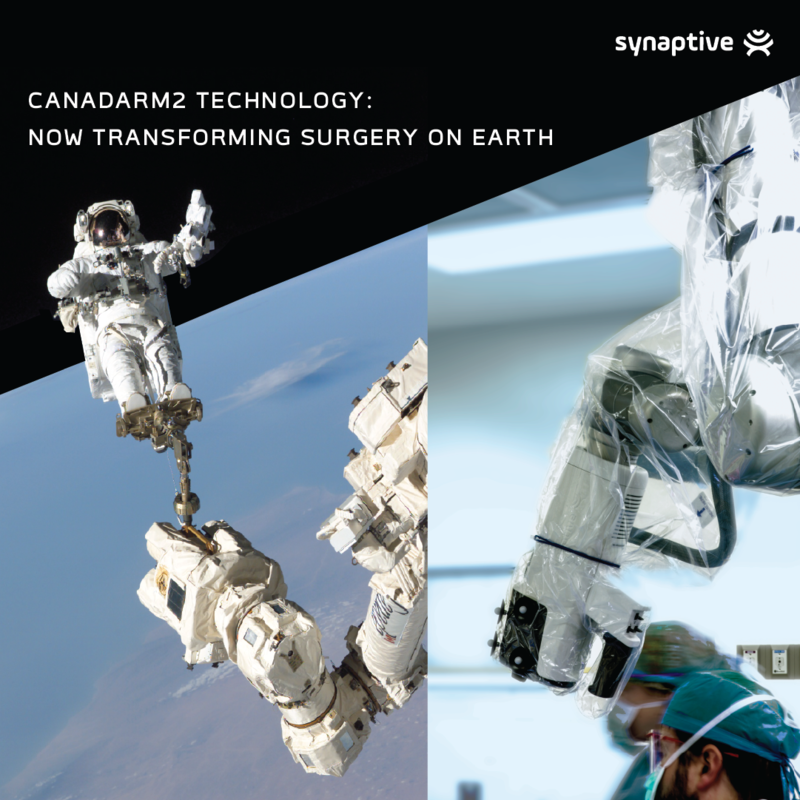 Both of Synaptive’s medical devices, currently used in cranial and spine procedures at hospitals across the globe, are derived from Canadarm2 technology. Launched into orbit in 2001, Canadarm2 helped to assemble the international space station and continues to play an active role in the station’s day-to-day operations. Becker’s Spine Review and Space.com covered this announcement. Space robotics originally developed to help astronauts on the International Space Station are now used in Modus V™ to help neurosurgery patients on Earth. Based on Canadarm2 technology, Modus V is a highly flexible instrument adept at aiding in delicate surgical procedures performed in a uniquely challenging environment. Both it and BrightMatter Drive, Synaptive’s first-generation system, were designed in collaboration with both surgeons and Canadian space robotics leader MDA, a business unit of Maxar Technologies. Modus V’s automation positions its high-powered optical payload via the robotic arm for a precise view of the surgical field, allowing surgeons to focus on the procedure. Automation allows the robotic digital microscope to seamlessly move and almost intuitively position itself with little effort from the surgeon. Modus V displays the surgical field on a large screen, providing the whole surgical team with a global view of the patient’s brain and spine. When used in combination with other Synaptive technologies, such as BrightMatter™ Plan and Guide, Modus V may allow surgeons to operate on brain tumors previously deemed inoperable. The NASA documentary also features Dr. Gavin Britz, neurosurgeon and director of the Houston Methodist Neurological Institute, speaking about his experience using Synaptive’s technology, along with footage of BrightMatter Drive at Henry Ford Hospital and Modus V at Florida Hospital Tampa. Based in Toronto and founded by a team of serial entrepreneurs, Synaptive Medical began operations in 2012 with six employees. After outgrowing the living rooms of its founding team, the company incubated in MaRS Discovery District’s entrepreneurship hub, and has since grown to over 240 highly-qualified personnel. Several members of the Synaptive team, including Josh Richmond, senior director of engineering, are MDA veterans applying technical skills refined in working on space technology to solving problems in the operating room. 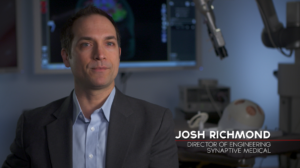 Synaptive Medical’s Josh Richmond, Senior Director of Engineering. With two facilities in Toronto’s fashion district, the company is building its global presence while continuing to refine its surgical, imaging and data products in collaboration with surgeons and researchers all over the world. © Synaptive Medical, 2012-2019. All rights reserved.